The fourth in the Flaxborough Mystery series is much better than the third. Lonelyheart 4122 is the anonymous number of the enigmatic man who possibly murdered two lonely women and may be working on his third. Inspector Purbright and Sergeant Love are searching for two missing middle-aged ladies. Mrs. Bannister is a relatively wealthy widow. Miss Reckitt is a spinster with some savings too. Their only connection is a lonely hearts club (think 1960s match.com), where both were looking for love and companionship. There is a parallel story line of Miss Teatime’s meeting with the mysterious 4122, who got her name from the club. I read the previous entry in the series and didn’t like the spy part of the plot. Here is my review of Hopjoy was Here. However, I liked the small village of Flaxborough and its citizens enough to read this one, the next book in the series. I’m glad I did. The mystery was much better especially the ending. People are still looking for love so this felt both modern and quaint in its methods. I can’t imagine what the villagers would think of Tinder and sexting! 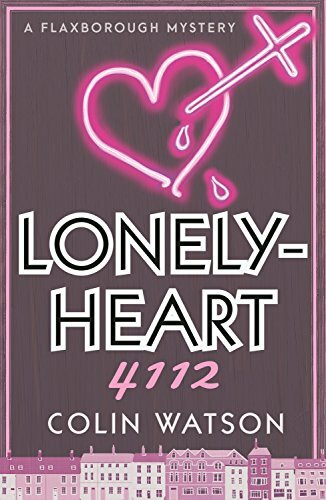 Overall, Lonelyheart 4122 earns 4 stars. Thanks to the publisher, Farrago, and NetGalley for an advanced copy.